We're going to have so much fun at summer camp this year! 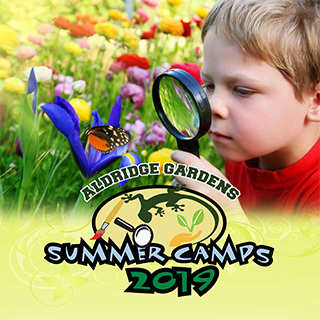 June will be a full month long of excitement, entertainment and, of course, education at Aldridge Gardens. We have plenty of camps to choose from for boys and girls entering Kindergarten through 5th grades. Whether your little campers like American Girls, art, science and technology, building and engineering, or myth busting, we've have something they're sure to enjoy! See below for more on camps being offered this summer, details on registration, forms, and more. Day camps run from 9:00 a.m. to Noon, Monday through Friday. Mid-morning snacks and drinks are provided. All teachers are Alabama Educators. Pre‐registration required. Register early. Camp enrollment is limited! Members can register as early as February 15th. Non-Members can register beginning March 1st. Enrollment is limited and pre-registration required. Refunds will be issued only if the session is filled or canceled by Aldridge Gardens. If you have questions or need more information, please contact Debbie McDonald, Education Director, at dmcdonald@aldridgegardens.com or call 205.682.8019. Emergency Medical Form and Carpool Authorization, to fill out, sign and bring with you the first day of camp.